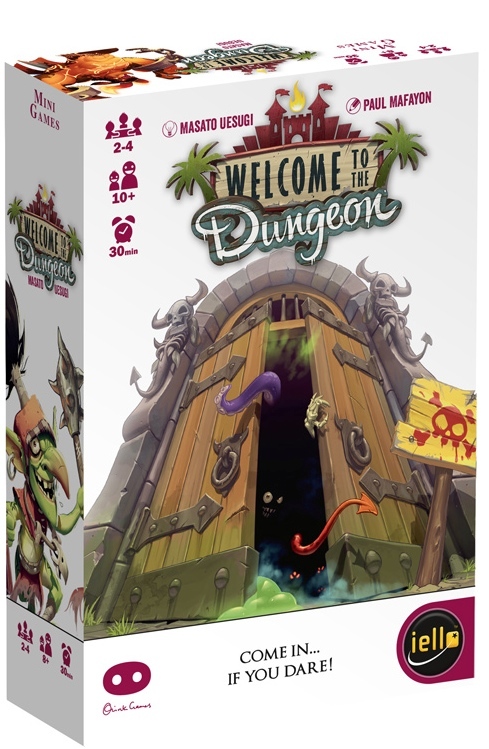 Welcome to the Dungeon is a simple easy to learn game, that’s both fun and quick to play. It’s well produced with great art, as most of IELLO‘s other titles, and it’s family friendly, so what’s not like? What’s Welcome to the Dungeon like? First you chose one of the 4 adventurers, that each have 6 unique pieces of equipment that interacts with monsters in different ways. Then players takes turns where they either draw a card from the monster pile or pass. If you pass you’re out for that round. If you chose to draw a monster you look at it and then again have two option, either you add the dungeon pile (face down) or take away a piece of gear from the adventurer. Either choice results in it becoming harder and harder for the hero to get through the dungeon. This continues until all but one player has passed. The player that didn’t pass now takes the hero through all the cards in the dungeon pile. The player gets a medal in the adventurer makes it through but takes a wound otherwise. First player to 2 medals wins the game and if you ever get 2 wounds you’re out of the game. While it would describe the game as fun, easy to learn and fast to play I do feel it’s missing some depth. It is a quick that does make up for this, but only a little. After several plays the game feels very one-dimensional to play, even with the 4 different adventurers. But I would not say no to playing it, and it is a good game if you want to play a couple of quick games with your friends. The game is very enjoyable to play, with exciting decisions. The quick play time is also a good match for a game like this. The theme feels pretty good, and cards and equipment for the adventurers all ties together nicely. Nothing feels pasted on or too mechanical. Great visuals both on the monster cards and the adventurer tokens. And nice thick cardboard always feels good. Rules are short and pretty simple and easy to understand.